Last winter wasn’t the mildest but it was a good one for over wintering herb plants outdoors in the garden. 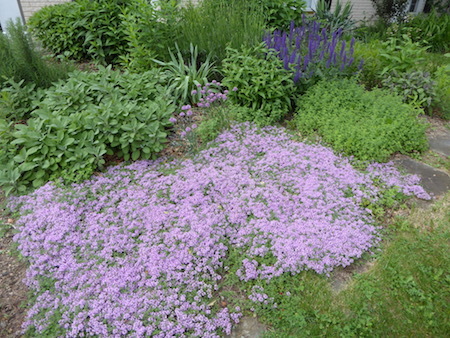 Even herb varieties that are typically borderline hardy here in my growing region survived to put on a great show in the landscape this spring and summer. A big part of that success is location and taking advantage of the various micro-climates that exist on my property even if the temperature variations, southern exposures, and favorable positions are only slightly better than other spots in the garden. The payoff comes the following season when over wintered herb plants show their full potential and yield results that you don’t get from herbs that are grown as annuals. Over wintered plants grow larger, bushier, and often produce flowers. You’ll also get considerable leaf production that can quickly stock your herbal pantry. Rosemary isn’t very hardy in my region, but when it survives the winter it will take on a tree-like appearance and become a very ornamental evergreen in addition to being a great culinary herb. It will also produce a profusion of attractive pale blue flowers that many gardeners have never seen in the garden. 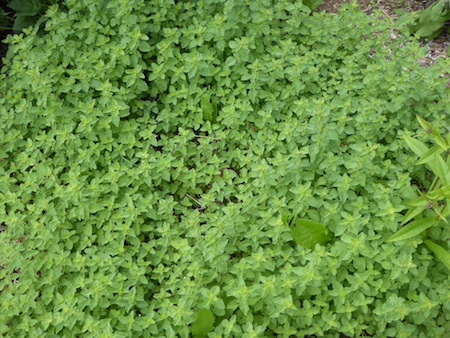 Oregano is a reliable winter survivor here in Central Pennsylvania and will spread nicely into a rounded mound of leaf growth to season pasta sauces and other recipes in the kitchen. During mid-summer the plant will be covered with tiny white flowers that bees and other pollinating insects can’t resist. The leaves are easily dried and stored to keep your homegrown oregano on hand. Thyme is a common and popular herb plant and this photo is an example of what a single plant can grow into within the space of a few years. 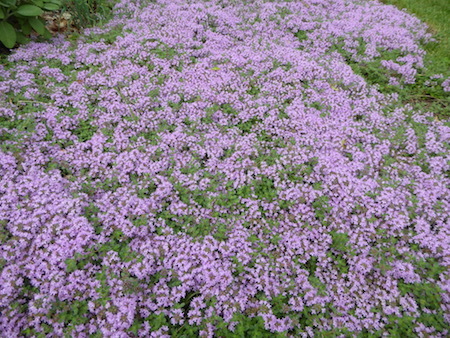 It is a great ground cover that will offer a splash of color from the flowers that will completely cover the plants early each spring. 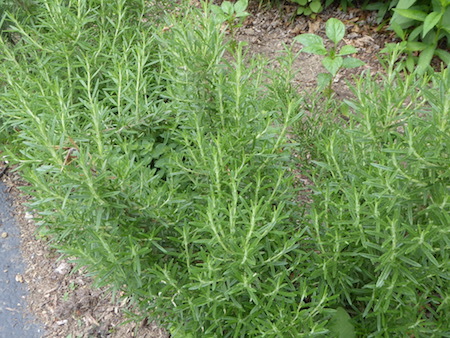 This is a carefree herb that you can count on to over winter without fail. Sage is hardier and more reliable than Rosemary but still not a guarantee to make it through a harsh winter on a consistent basis. But when it does survive you’ll wind up with enormous plants, plenty of leaves for cooking with, and a display of sage flowers. 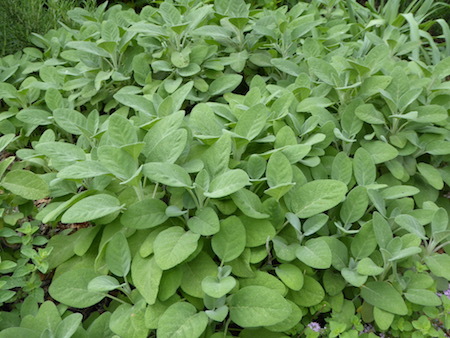 With all these leaves you’ll need to find new uses for sage such as including this herb in omelets, grits, and even breads for a unique flavor experience. 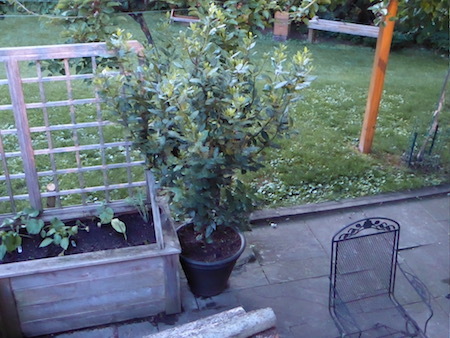 Bay Laurel is another one of my favorite over wintered herbs, but in this case you will have to bring it indoors for the winter if you want it to survive in cold weather regions. The reward will be a tree that will need to be pruned annually just to maintain it at a manageable size that can be moved from house to patio as the seasons change. The prunings will provide you with more bay leaves than you can use in the kitchen and save money on those expensive little jars sold at the market!